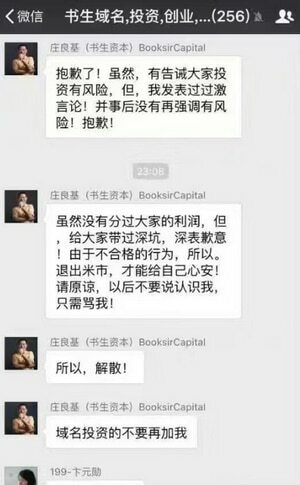 Booksir announces to WeChat group that he’s exiting the domain name business. A prominent Chinese domain name investor has announced on WeChat that he’s getting out of the domain name investing business. Zhuang Liangji (庄良基), known as Booksir, says he has gotten rid of 70,000 .cc domain names that he bought at an average CNY 120 each ($18.00 US). That’s a $1.25 million dollar investment. His WeChat post isn’t clear on if he received any compensation for the domain names. A rough translation is that he “gave up/abandoned” the domain names. Booksir has a number of other businesses, so it seems like he has decided that domain name investing isn’t where he wants to focus his efforts. He was scheduled to speak at next month’s THE Domain Conference in Florida, but his profile is not currently on the show’s website.